Longstanding readers of this blog may recall my intention to work through Ross Macdonald’s hardboiled novels – more specifically the books featuring his Los Angeles-based private detective, Lew Archer. Find a Victim is number five in the series – not the pick of the bunch by any stretch of the imagination, but an entertaining read nonetheless. (Here are the links to my reviews of the earlier books in the series, The Drowning Pool [#2], The Way Some People Die [#3] and The Ivory Grin [#4] – all can be read as standalone works.) While it may sound a little odd, this was a comfort read for me. I know what I’m going to get with a Lew Archer novel: something familiar yet satisfying with enough twists and turns to maintain my interest. And that was broadly the case here – it turned out to be just what I needed to read after the rather episodic nature of The Adventures of Sindbad. So, back to Find a Victim. As the book opens, Archer is driving from Los Angeles to Sacramento when he is flagged down by a blood-stained man who has been shot and left to die in a ditch near a deserted stretch of the highway. With no sign of life for miles, Archer puts the severely wounded man in the back of his car and sets off to find help in the nearest town, a place called Las Cruces. On his arrival at a motel on the outskirts of town, Archer arranges for an ambulance to take the injured man to hospital – an action which turns out to be too late as the man dies before the medics can save him. Consequently, Archer must hang around to assist the authorities with their enquiries into the murder, a development that piques the detective’s interest especially once he starts to get the measure of the neighbourhood and its rather shady inhabitants. La Cruces in the sort of small town where everybody is either related to or connected with everybody else. Archer encounters open hostility from the off: the motel owner is none too pleased with Archer for turning up with a dying man in his car; the local Sheriff seems defensive and mistrustful of him, especially once he realises that he’s dealing with a private eye; even the dead man’s boss, a local big-shot named Meyer, seems to have something to hide. (It turns out that the dead man, Tony Aquista, was driving a lorry containing a large consignment of bonded bourbon when he was shot. The truck in question is now missing, probably hijacked during the shooting – another crime for the authorities to follow up as soon as poss, especially given the nature of the cargo.) All is not well with the women in the town either. Kate Kerrigan, the motel owner’s wife, is clearly trapped in an abusive and loveless marriage, a point that Archer deduces from the word go. Then there is the question of Meyer’s daughter, Anne, who manages Kerrigan’s motel – she has been missing for the past week after failing to show up at work. As a consequence, Archer feels compelled to get involved in the case, whether the locals want him to or not. “What can I do for you, Mr. Archer?” His grooved, stubborn mouth denied his willingness to do anything for anybody. What follows is a sequence of events that leads Archer deeper and deeper into a complex web of vice, one that includes additional murders, robberies, corruption, adultery and sexual abuse – interestingly, family conflicts and double-dealings are themes that run through a number of these novels. In Archer, Ross Macdonald has created a detective with a conscience, a fundamentally decent man who doggedly pursues the truth, even when he knows it will lead to some dangerous encounters along the way. As in the previous novels, Archer gets beaten up and thrown around by those who are aiming to protect their own interests, and yet he keeps on coming back for more. Moreover, his conviction in getting to the heart of the matter is thorough and unrelenting. When the District Attorney tries to pin the crimes on the ‘obvious’ suspect, Archer refuses to accept the convenient option; he follows his instincts, refusing to dismiss any nagging doubts in the process. By so doing, it is clear that he will discover the true perpetrators of the crimes in question, even if the authorities seem less than willing to listen to him. As I mentioned a little earlier, this isn’t the strongest of the early Lew Archer novels; some of the characters feel a little thin and clichéd. In particular, it lacks a distinctive female figure, someone like Galatea from The Way Some People Die or the vulnerable and damaged Maude Slocum from The Drowning Pool. Nevertheless, there are some nice touches here and there, like this description of the motel owner, Don Kerrigan. One of the most enjoyable aspects of these Lew Archer novels is Macdonald’s ability to evoke a strong sense of place. From the seedy bars and clubs of small towns like Las Cruces to the barren terrain of the Californian desert to the mountains near the border with Nevada, it’s all here. All in all, this is probably a book for Archer completists. If on the other hand you’re looking to try one of the early novels just to get a sense of Macdonald’s style, then I would recommend either The Drowning Pool or The Way Some People Die, both of which are excellent reads. Finally, I must give a shout-out to Max at Pechorin’s Journal who persuaded me to read these novels in the first place. Here’s a link to his excellent review of #1 in the series, The Moving Target. 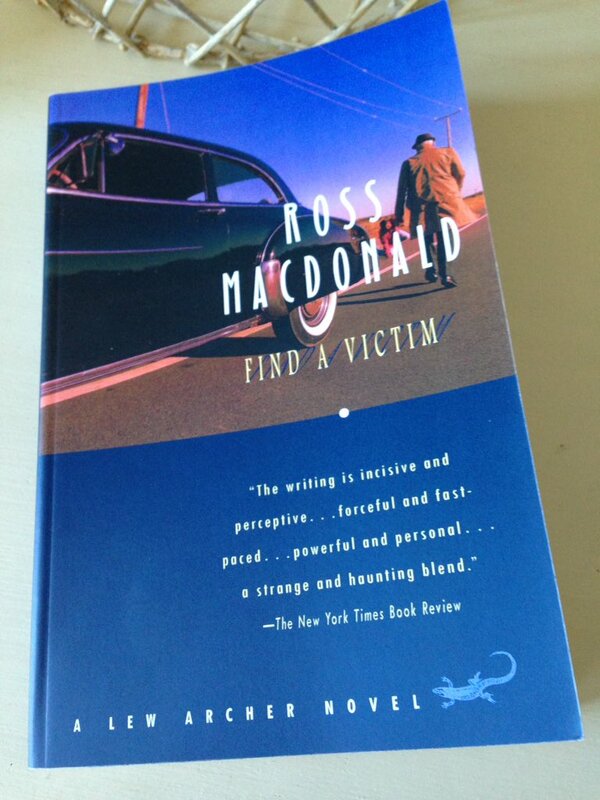 Find a Victim is published by Vintage Crime/Black Lizard; personal copy. 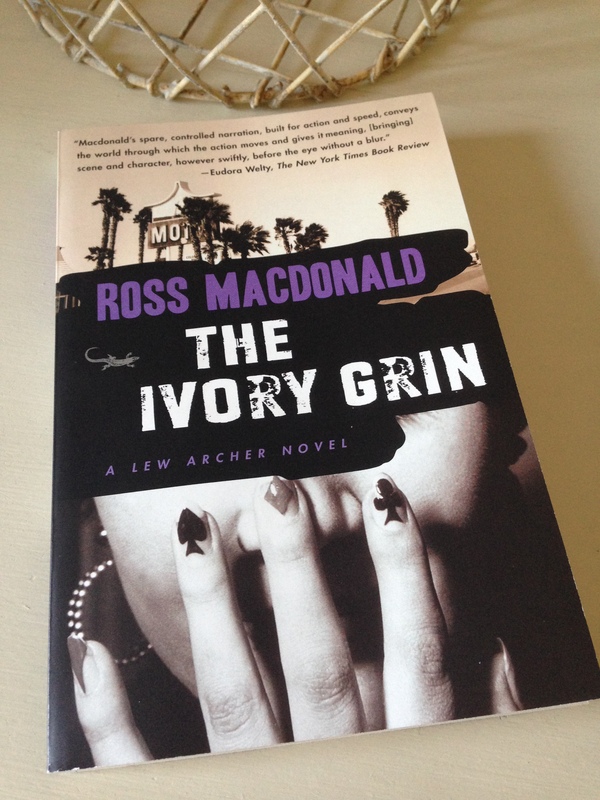 The Ivory Grin (1952) is the fourth book in Ross Macdonald’s series featuring the Los Angeles-based private eye, Lew Archer. I’ve been trying to read them in order, so here are links to my reviews of the second and third novels in the series, The Drowning Pool and The Way Some People Die, both of which I would wholeheartedly recommend – they can be read as standalone works. I found her waiting at the door of my office. She was a stocky woman of less than medium height, wearing a blue slack suit over a blue turtleneck sweater, and a blue mink stole that failed to soften her outlines. Her face was squarish and deeply tanned, its boyish quality confirmed by dark hair cut short at the nape. She wasn’t the type you’d expect to be up and about at eight thirty in the morning, unless she’d been up all night. Una claims she is looking for a former employee – a young ‘coloured’ maid named Lucy – who has disappeared along with a pair of ruby earrings and a gold necklace. At first, Archer proposes that this is a matter for the police; Una, however, doesn’t want them involved, keen as she is to talk to the girl to see what she’s up to. Archer is none too keen on Una and remains rather sceptical about her stated motivations for wanting to find Lucy. That said, curiosity gets the better of him and he agrees to do a little surveillance, at least in the short term. According to Una, Lucy has been seen at a restaurant in Bella City, so Archer heads off to find the girl to monitor her movements for a while. Archer finds Lucy and follows her for most of the afternoon, the trail taking him from the bungalow where she’s been renting a room to a seedy motel in the same area. When she hears of Lucy’s whereabouts, Una decides to pay the girl a visit at the motel, giving Archer instructions to resume his surveillance once she has left. As Archer continues to follow Lucy, the journey takes him to the office of a certain Dr Benning, whom the girl consults before heading to the railway station. Along the way, Archer realises that there is someone else on Lucy’s trail, another private eye named Max Heiss, who tries, rather unsuccessfully, to persuade our detective to collaborate on the case. In the meantime, Lucy’s boyfriend, Alex, pulls up to the station in his car, picks up the girl and drives off, losing Archer in the process. When he returns to the Mountview Motel later that afternoon, Archer discovers that Lucy has been murdered, her throat cut from ear to ear. At this point, we meet one of my favourite characters in the novel, the world-weary police chief, Lieutenant Brake. Here he is, talking to Archer at the scene of Lucy’s murder, a passage that illustrates Macdonald’s skill with dialogue. Alongside this first strand, a second one starts to open. When Archer finds Lucy’s body in the motel room, he also discovers a newspaper clipping in her purse – namely, an article advertising a $5,000 reward for information on the whereabouts of a young socialite called Charles Singleton. Some two weeks earlier, around the same time as Lucy’s disappearance from Una’s employ, Singleton had also vanished (he was last seen in the public rooms of a local hotel). As a rather reluctant heir to the family business, Singleton had been trying to break away from his wealthy mother and her money for years – ideally, he wanted to create a life of his own. So, following the discovery of the clipping, Archer heads off to Arroyo Beach to visit Mrs Singleton in her home. Once there, he is hired by the lady’s young companion, Sylvia Treen, with the aim of finding Charles, hopefully still alive. The two cases are of course connected, but I’m reluctant to reveal how – let’s just say that they intersect in unexpected and complex ways. Lieutenant Brake is convinced that Lucy’s boyfriend, Alex, is responsible for his girlfriend’s death, especially when the murder weapon turns out to be the boy’s knife. Archer, however, isn’t buying this, especially once the details surrounding the Singleton case start to emerge. Another high point is Lew Archer himself, a detective I’m growing to love more and more with every novel in the series. On the whole, Archer treats people with respect. He is a good judge of character, keen to observe and scrutinise wherever possible, but compassionate too. Archer’s treatment of the black characters is very sympathetic; he is on the side of decent people, irrespective of their colour, race and gender. 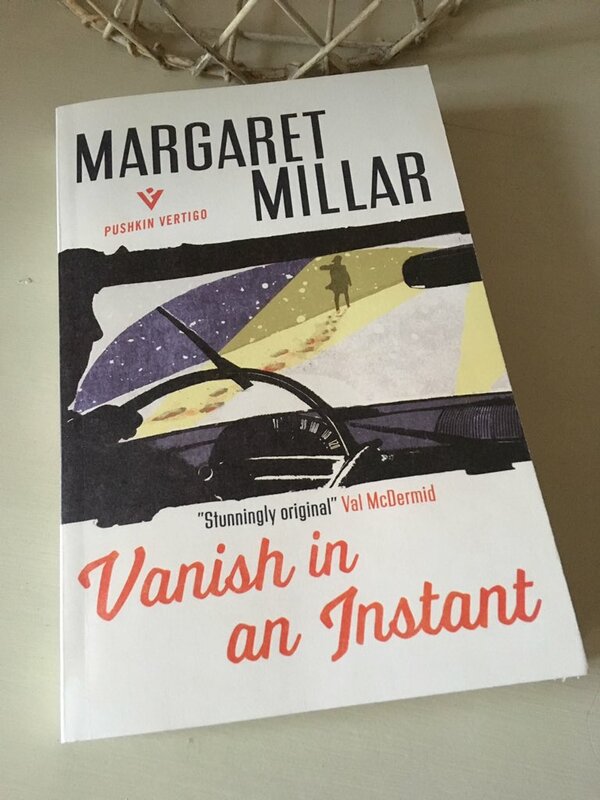 There are some very nice touches with some of the minor characters too, most notably an elderly next-door neighbour who proves useful to Archer in his surveillance of Lucy, and a homely milliner who lives with her cat. Macdonald captures their personalities with just the right amount of colour. The novel is very strong on the sense of place and period. Small-town America in the 1950s is portrayed in vivid detail, a community divided into ‘lighter and darker hemispheres’ by the highway that runs through it. Archer finds himself in the bottom half, a run-down place packed with laundries, warehouses, and dilapidated houses. Alongside this picture of the small-scale environment, Macdonald’s descriptions of the Californian landscape are as evocative as ever. I’ll finish with a final quote on the scenery surrounding Bella City – Archer is driving there in search of Lucy. 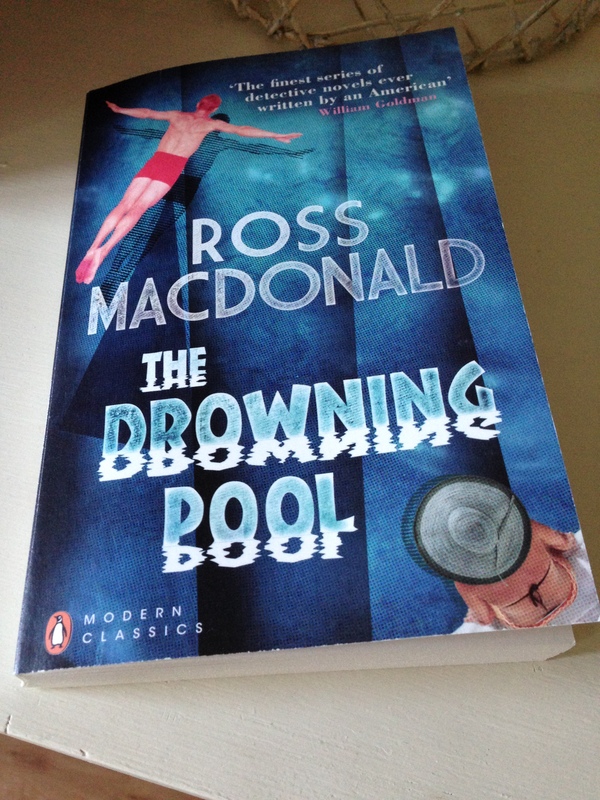 Last year, The Drowning Pool, the second book in Ross Macdonald’s ‘Lew Archer’ series of hardboiled detective novels, rescued me from a brief reading slump. Next up then is number three in the series, The Way Some People Die, which I’d picked up a couple of years ago following Max’s excellent review. As the novel opens, Lew Archer, a private investigator working the suburbs of Southern California, is called to the Santa Monica home of worried mother, Mrs. Samuel Lawrence. Her daughter, Galatea (‘Galley’) Lawrence, a nurse at Pacific Point hospital, has been missing without a trace for a couple of months. Prior to her disappearance, Galley was nursing a guy named Speed, who had been shot in the stomach in suspicious circumstances. To add to the intrigue, Galley was last seen moving out of her apartment in Pacific Point accompanied by an unknown man of a sinister nature. Consequently, Mrs Lawrence is worried that her daughter, a girl who attracts men like bees to a honey pot, has got herself mixed up in some kind of trouble. As he goes about his business, Archer discovers that Galley appears to have disappeared with a small-time hoodlum called Joey Tarantine. Joey and his brother Mario are connected to a bigger fish, a powerful gangster named Dowser, and it’s not long before Archer find himself face-to-face with this predator. Dowser is a thoroughly nasty piece of work, a man whose main methods of communication are money and violence (not necessarily in that order). Even though he despises Dowser and his type, Archer knows he will have to deal with him to uncover the mystery surrounding Galley’s disappearance. I don’t want to say too much about the plot, but it’s deliciously twisty and turny. There are bluffs and double-crosses, murders and bloodshed, drugs and dollars. It’s a proper mesh of vice, a world populated by villains with fat rubber faces, and Galley can be found right in the middle of it. I also love the way Macdonald evokes a strong sense of place, the dimly-lit city streets and dark underbelly of the California suburbs. The trail takes Archer from Pacific Point to Palm Springs to San Francisco. The territory is dark and atmospheric. And lastly, but by no means least, there’s Lew Archer himself. Macdonald has created a wonderful character in Archer, one the reader can invest in and care for. He is world-weary but also humane and compassionate. He can see Mrs. Lawrence is down on her luck as soon as he arrives at her home. The Way Some People Die is a terrific hardboiled novel, probably my favourite of the three Lew Archer books I’ve read so far. It’s nicely paced, and the absorbing narrative keeps the reader guessing right up to the very end. The denouement, when it comes, is thoroughly satisfying. 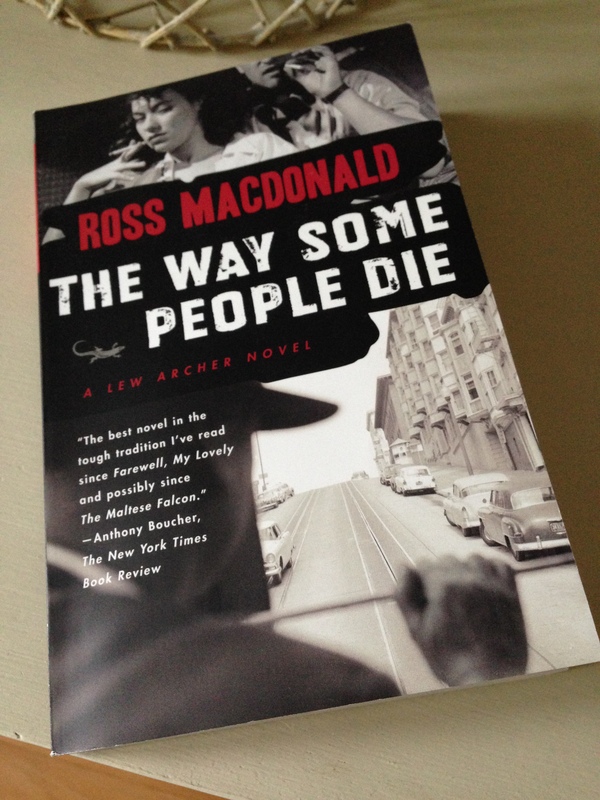 If, like me, you enjoy the likes of Chandler and Hammett, Ross Macdonald is worthy of your time – he’s one of the best. The Way Some People Die is published by Vintage Crime / Black Lizard. Source: personal copy. A few weeks ago I hit a bit of a reading slump; a couple of disappointments, one or two abandoned books and a terrible migraine left me craving something familiar and satisfying. Around the same, a conversation with Max (Pechorin’s Journal) reminded me of the brilliance of Ross Macdonald. So I decided to reread The Drowning Pool (which I’d read pre-blog) and write about it here. The Drowning Pool is the second in Macdonald’s series of hardboiled novels featuring private investigator Lew Archer. I haven’t read The Moving Target, the first in the series, but Max has reviewed it along with The Drowning Pool, and as ever his reviews are well worth a few minutes of your time. As the novel opens, Archer (our narrator) receives a visit from a visibly hesitant and frightened Maude Slocum. I love Macdonald’s description of Maude’s eyes in the passage above, the way her eyes hint at her troubled past; the things they’ve seen, not all of them good. As Archer sets about his business by following James Slocum, he encounters various members of the family and their associates. There’s the Slocums’ somewhat troubled fifteen-year-old daughter, Cathy, who seems to be involved with Reavis, the family’s chauffer. The Slocums’ marriage is clearly strained, and there’s a feeling that James is attracted to the company of Mr Marvell, author of a play being staged by the local theatre group. We are also introduced to Maude Slocum’s mother-in-law, owner of the Slocum residence which happens to be worth a cool couple of million due to the oil residing beneath its grounds. The mother-in-law has, however, refused to sell even an acre of the property, leaving James and Maude highly dependent on her hospitality and a rather meagre allowance. There are one or two other key players in the story, but I’ll leave you to discover them for yourself should you read the book. That’s about as much as I’m willing to reveal about the plot. Save to say it’s well paced, and when the resolution comes, it illuminates certain scenes and interactions in the earlier sections of the book. Moreover, this plot feels somewhat less convoluted, more plausible than some of Raymond Chandler’s. As I mentioned in my review of Farewell, My Lovely, what I love about Chandler is his sharp dialogue, attitude and mood. His novels are powered by his irresistible prose style, and the storylines seem secondary to these stylistic aspects. Macdonald has created a nuanced investigator in Lew Archer, one that the reader can invest in and care for. I’m looking forward to seeing how his character develops over the course of the series as I’ve decided to carry on reading them in order. I’ll just have to forget that I read The Galton Case (mid-period Archer) last year and erase it from my mind. In the meantime, I can thoroughly recommend The Drowning Pool; just as satisfying, if not more so, the second time around. The Drowning Pool is published in the UK by Penguin Modern Classics. Source: personal copy.